Supermassive black holes, with their immense gravitational pull, are notoriously good at clearing out their immediate surroundings by eating nearby objects. 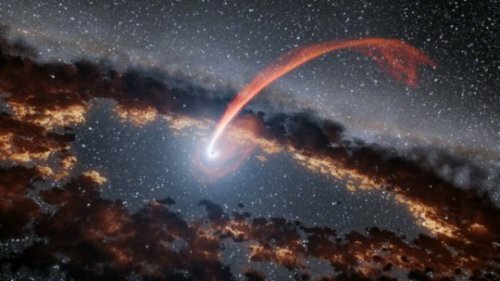 When a star passes within a certain distance of a black hole, the stellar material gets stretched and compressed — or “spaghettified” — as the black hole swallows it. Astronomers now have new insights into tidal disruption flares, thanks to data from NASA’s Wide-field Infrared Survey Explorer (WISE). Two new studies characterize tidal disruption flares by studying how surrounding dust absorbs and re-emits their light, like echoes. This approach allowed scientists to measure the energy of flares from stellar tidal disruption events more precisely than ever before. 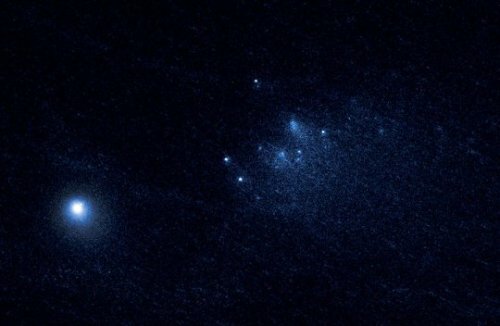 Astronomers have captured the sharpest, most detailed observations of a comet breaking apart 67 million miles from Earth, using NASA’s Hubble Space Telescope. The discovery is published online in Astrophysical Journal Letters. Based on the Hubble data, the research team suggests that sunlight heated the surface of the comet, causing it to expel jets of dust and gas. Because the nucleus is so small, these jets act like rocket engines, spinning up the comet’s rotation, Jewitt said. The faster spin rate loosened chunks of material, which are drifting off into space. The research team calculated that the comet probably shed material over a period of months, between October and December 2015. Jewitt suggested that some of the ejected pieces have themselves fallen to bits in a kind of cascading fragmentation. “We think these little guys have a short lifetime,” he said. Hubble’s sharp vision also spied a chunk of material close to the comet, which may be the first salvo of another outburst. The remnant from still another flare-up, which may have occurred in 2012, is also visible. The fragment may be as large as comet 332P, suggesting the comet split in two. But the remnant wasn’t spotted until Dec. 31, 2015, by a telescope in Hawaii. The icy visitor hails from the Kuiper belt, a vast swarm of objects at the outskirts of our solar system. As the comet traveled across the system, it was deflected by the planets, like a ball bouncing around in a pinball machine, until Jupiter’s gravity set its current orbit, Jewitt said. To take a close look at the planet formation site, a research team led by Takashi Tsukagoshi at Ibaraki University, Japan, observed the young star TW Hydrae. This star, estimated to be 10 million years old, is one of the closest young stars to Earth. 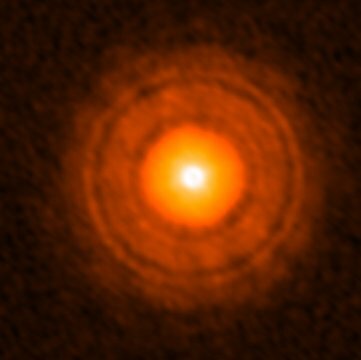 Thanks to the proximity and the fact that its axis of rotation points roughly in Earth’s direction, giving us a face-on-view of the developing planetary system, TW Hydrae is one of the most favorable targets for investigating planet formation. Researchers calculated the mass of the unseen planet based on the width and depth of the 22 au gap and found that the planet is probably a little more massive than the Neptune. “Combined with the orbit size and the brightness of TW Hydrae, the planet would be an icy giant planet like Neptune,” said Tsukagoshi. 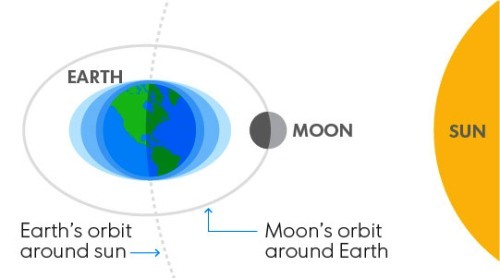 Could California’s long-dreaded “Big One” be triggered by a full moon? Perhaps, says a new study out Monday that claims large earthquakes are more likely during unusually high tides, which occur during full and new moons. Big quakes can occur when this additional weight of tidal water strains geological faults, according to the study. Though this theory is not new, this is the first study to display a firm, statistical link. “The probability of a tiny rock failure expanding to a gigantic rupture increases with increasing tidal stress levels,” the study said. Precisely how large earthquakes occur is not fully understood, but scientists say they may grow via a cascading process where a tiny fracture builds up into a large-scale rupture. If so, the authors’ results imply that the likelihood of a small fracture cascading into a large earthquake are greater during high tides. The study was led by Satoshi Ide, a seismologist at the University of Tokyo and appeared in the peer-reviewed British journal Nature Geoscience. Ide found that some of the most devastating recent earthquakes, such as the 2004 Sumatra quake that killed 230,000 people and the 2011 quake in Japan that killed 15,000, both hit during periods of high tide. In fact, his research team determined that nine of the 12 biggest quakes on record happened near or on days with full or new moons. The scientists found no clear correlation between high tides and small earthquakes. “Scientists will find this result, if confirmed, quite interesting,” said University of Washington seismologist John Vidale, who was not part of the study. He cautions that “even if there is a strong correlation of big earthquakes with full or new moons, the chance any given week of a deadly earthquake remains miniscule,” making predictions rather unhelpful. The study’s other authors are Suguru Yabe and Yoshiyuki Tanaka, also of the University of Tokyo. A strong earthquake has rocked Colombia, striking close to one of the country’s largest cities and forcing people to run for their lives during a mass evacuation of the surrounding area. More than 400 people had to flee their homes in Citadel Sevilla, Medellin – the home city of infamous cocaine drud lord Pablo Escobar. People at the scene were “terrified” by the sizeable 6.0 magnitude quake, which is believed to have lasted around 30 seconds and was followed by an intense aftershock. The local authority has initiated its Disaster Risk Management plan amid fears of landslides taking place in the rural region, which has been battered by heavy rains in recent days. 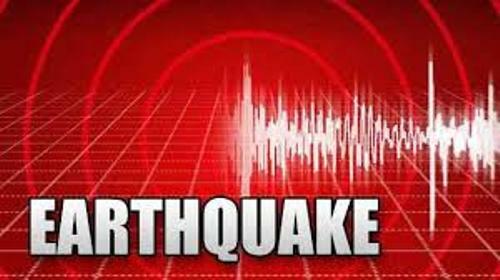 The quake, which took place aroun 8pm local time, was also felt in Bogota – 400km away. Express.co.uk spoke to two tourists currently staying in nearby Sabaneta. Other locals reported a 13 storey hotel building shaking ominously during the tremor. Fears are growing for the surrounding population, especially considering a weaker 5.6 magnitude earthquake in 2008 killed 11 people in El Calvario. The tremor originated 45 miles below the surface, according to geologists, and the region is located in a subduction zone, meaning earthquakes occur inland. George Donnelly tweeted from Colombia to say he felt the earthquake and he claimed it went on for a long time. There are no reports of fatalities as yet. At the time of the earthquake a football match was taking place in the Atanasio Girardot in Medellin between Nacional de Medellín and Bolivar in the South American Cup – Medellin won 1-0. A new study led by Western University’s all-star cosmochemist Audrey Bouvier proves that the Earth and other planetary objects formed in the early years of the Solar System share similar chemical origins — a finding at odds with accepted wisdom held by scientists for decades. The findings were published today by the journal Nature. Bouvier, the Canada Research Chair (CRC) in Planetary Materials and an Isotope Cosmochemistry professor in Western’s Department of Earth Sciences, made the game-changing discovery in collaboration with Maud Boyet from the Magmas and Volcanoes Laboratory at Blaise Pascal University in Clermont-Ferrand, France. With data uncovered through thermal ionization mass spectrometry, Bouvier and Boyet demonstrated that the Earth and other extraterrestrial objects share the same initial levels of Neodymium-142 (142Nd) — one of seven isotopes found in the chemical element neodymium — which is widely distributed in the Earth’s crust and most commonly used for magnets in commercial products like microphones and in-ear headphones. This study was supported by the National Science Foundation, France-Canada Research Fund, the Natural Sciences and Engineering Research Council of Canada (NSERC) CRC and Discovery Grant programs, the Institute of Earth Sciences of the French National Center for Scientific Research (CNRS) and ClerVolc, the Clermont-Ferrand Centre for Volcano Research.